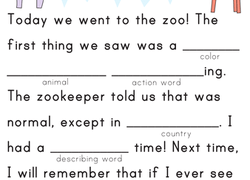 This funny, zoo-themed story gets your first grader to practice grammar and reading practice. With this worksheet, students will practice reading sentences while touching each word, then analyze the plural nouns in the sentences. 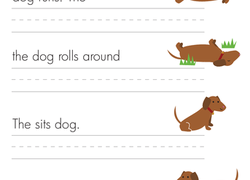 Help your first grader build his reading and writing skills with this early writing worksheet. Students will practice identifying conjunctions, possessive pronouns, and articles by reading a story about going to a park.